New Images released of Marvel Select’s Infinity War figures. At SDCC this year Diamond Select Toys revealed their Marvel Select Infinity Wars. It should be noted that these figures were hinted at before their official announcement at SDCC. 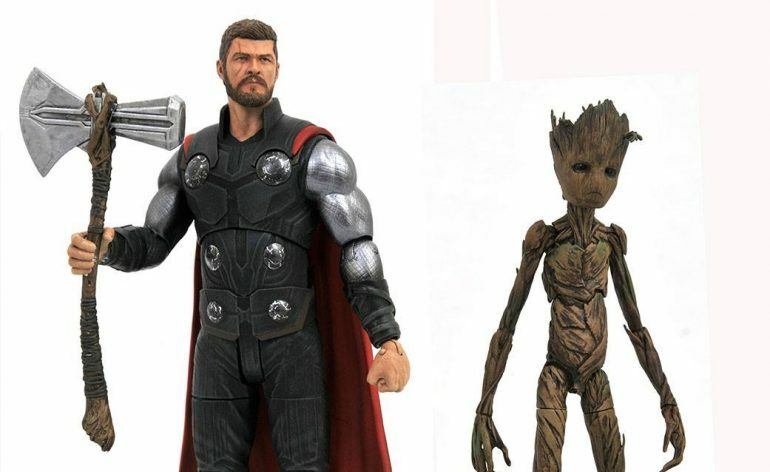 The three figures that they’ll be releasing from the hit film are Captain America, Thor, Teenage Groot, and Iron Spiderman. I have to say these figures look fantastic. The likeness to Evan’s is not the best but the detailing in his costume is amazing with the ripped off star showing the armor hidden beneath his costume. It’s a great nod to the comic book look. All the details of his costume are there and I love the texture that they’ve included in this figure especially the texture work in the pants. The paint is done very well too. The likeness to Evans is okay, I’m sure it’ll look better in hand. He’ll come with two different versions of his new shields, A pair of collapsed versions and an extended pair. I don’t think that we’ve gotten any other figure of Cap from Infinity War that can do that. 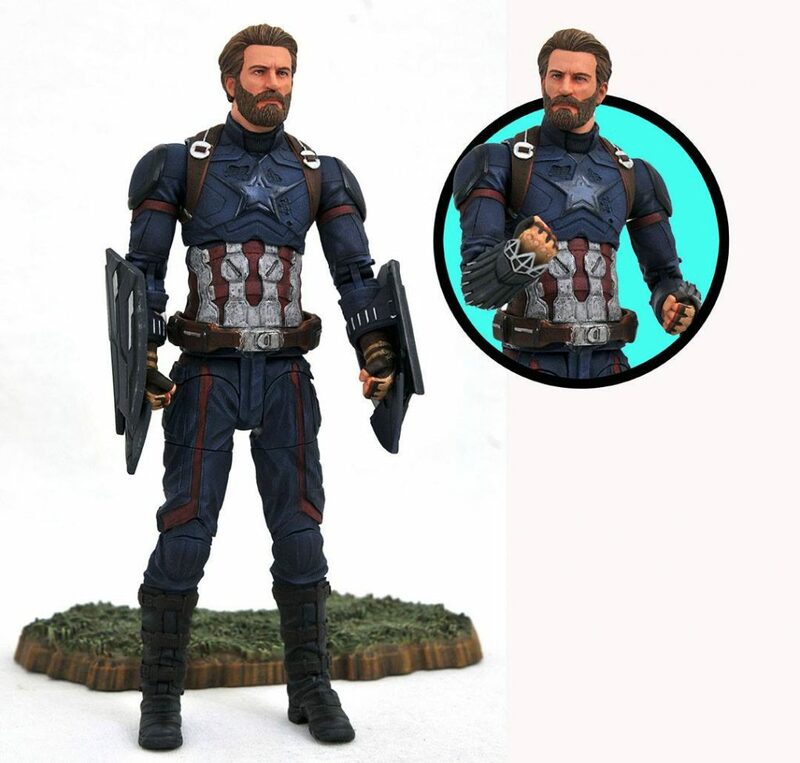 He’ll come with a base which looks to be part of Wakanda. 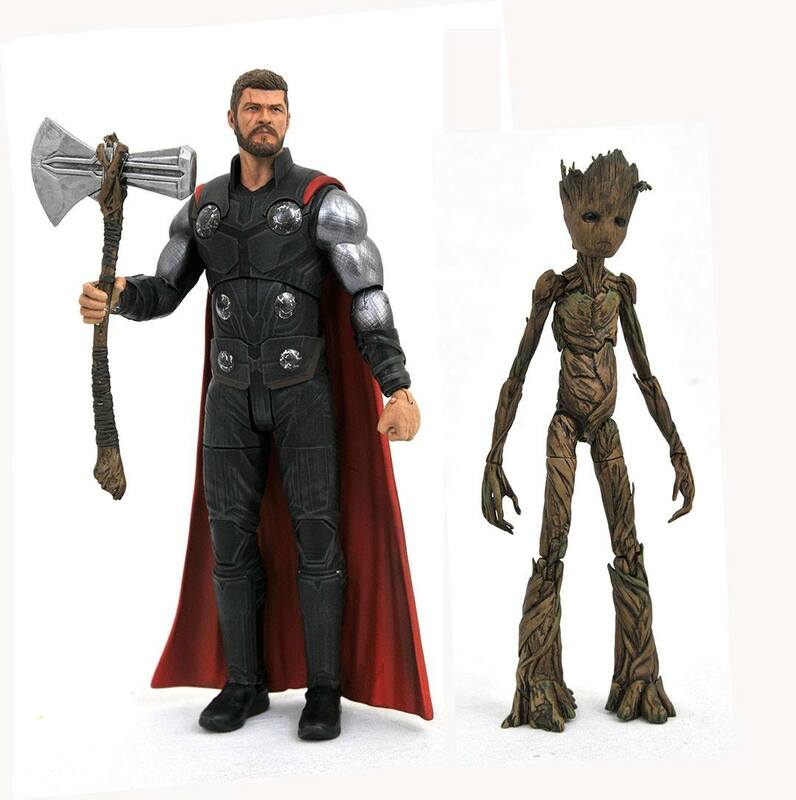 The Thor figure is based on his look from the second half of the film when he’s armed with Stormbreaker. This looks to be a fantastic looking figure. The likeness of Chris Hemsworth is pretty good & the detailing in the head is great with his short haircut and beard and the scar which Hera gave him in Thor Ragnorock. Of course, he has his newly acquired eye and wearing the armor he wore when he made his grand epic entrance on Wakanda. I love the detailing on this, especially the orbs on his armor which look well worn and cracked which is a great attention to detail as his costume acts as a conduit for his powers. Also, Stormbreaker looks amazing. The head of the axe has a great paint wash on it and the arm made of Groot’s actual arm is fantastic as well with a great dark paint wash over it really bringing out the detail. Not only that he also comes packed with Teenage Groot! this figure looks amazing and is the icing on the cake for the Thor figure. The detail is exquisite throughout the figure, I love the grouchy facial expression which captures Groot’s mood throughout the film perfectly. He’s even got little plants growing on top of his head. He looks to be fully articulated as well. The final figure that they are releasing from the film is Iron Spider. I have to say this figure looks absolutely outstanding. The detailing and texture work is amazing. You can really tell that this is a suit of armor than just a costume with shoulder pauldrons and gauntlets. The paint job makes the figure really pop as well and it looks super clean as well. The mix of gold, blue and red works very well and I love the sheen that really gives it a metallic look. 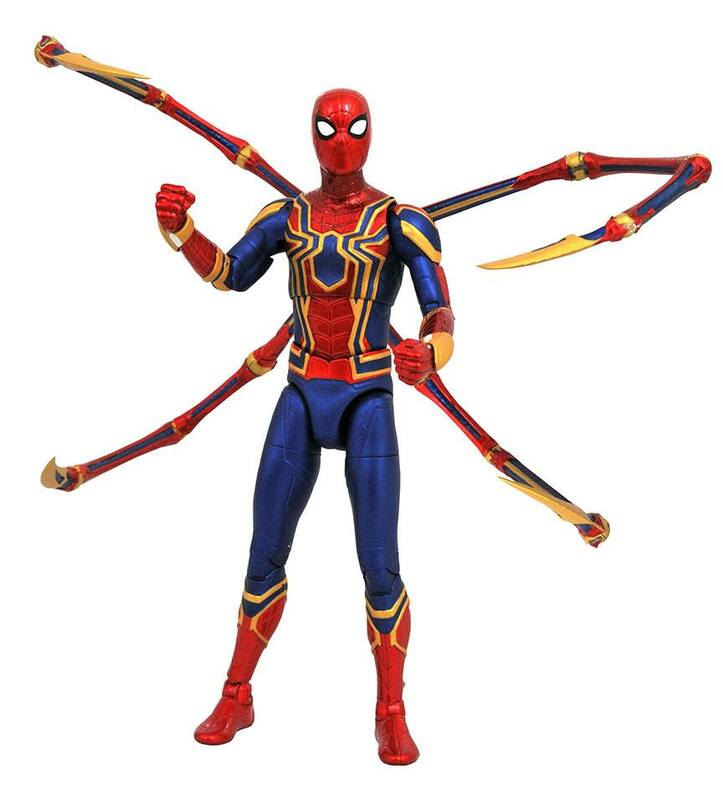 Also, they included the Iron Spider arms and they look so well detailed! These figures will be released in December this year so I’m sure more details of the figures and packaging shots will be shown off before the figures are released. All these look outstanding in their own way and are must-haves for me. They’ll be released in December and will cost around $24.99.